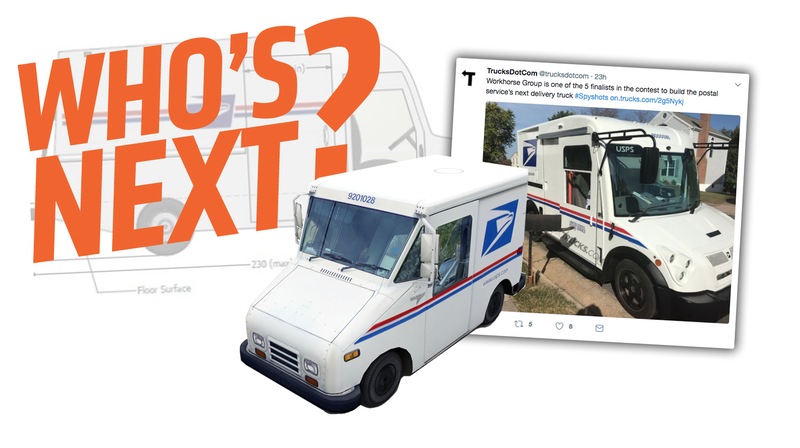 I’m not sure if you’re aware of this or not, but one of the biggest competitions in the automobile world is happening right now, under our very noses: the race to see what vehicle will be delivering our mail. The Grumman Long Life Vehicle (LLV) that has been delivering America’s mail since the 1980s is nearing the end of its Long Life, and there’s potentially 180,000 U.S. Postal Service trucks needed to take the LLV’s place. Right now, a number of vehicle-builders are competing for the contract, including AM General, Oshkosh, Karsan, Mahindra, and the makers of the truck just spotted in Virginia, the team of Workhorse Group and VT Hackney. Workhorse has been building electric pickup and delivery trucks and is providing the chassis and drivetrain of the all-electric mail truck, while VT Hackney is handling the body. Woah, look at that. That’s an interesting-looking vehicle. While the USPS’ Next Generation Delivery Vehicle Program rules don’t require an all-electric solution, about half of the entries do feature hybrid or alternative-fuel technology, though the Workhorse/VTHackney entry appears to be the only fully battery/electric vehicle. The Workhorse electric mail truck is based largely on Workhorse’s pickup truck, the W-15, there do appear to be some key differences, the most notable of which is the replacement of the W-15's large range-extending gasoline engine with a smaller unit from BMW. Maybe the same modified motorcycle engine that acts as a range extender in BMW’s i3? The all-electric range of the W-15 is 80 miles, and the truck can hold 2,200 lbs. The Post office requires only 1,500 lbs of payload. That’s a lot of mail! The design of the Postal Truck is interesting; the hood is quite low and sloping., and the greenhouse is very tall, with a huge, panoramic windshield. The triple-headlight cluster gives the truck’s face a sort of insectoid-alien look, and the whole thing looks comfortingly like a familiar mail truck, just somewhat more modern. I think for most mail carriers, the biggest question will be if these things have air conditioning. Current LLVs don’t have anything but a dinky little fan, and the trucks get pretty miserable in the summer heat. This competition is already turning out to be pretty interesting. Bozi, everyone’s favorite document-comber, found details on Mahindra’s entry, which appears to be based on their Genio truck, but with an engine from a Chevy Colorado pickup, fitted with GM’s mild hybrid setup. I’ve actually driven a Genio and liked it, so I’m very curious to see how Mahindra’s bid turns out. In case you’re wondering why any rational person would care about mail trucks at all, I’d just like to point something out: for most people, a mail truck is the only vehicle they encounter on a regular basis that isn’t built by one of the mainstream automakers. Grumman LLVs are interesting because they’re not some modified Ford or GM product or whatever. They’re their own unique thing. So many American cities are just parades of the same four or five kinds of SUVs and cars that injecting something somewhat unexpected into the mix via something as mundane as a mail truck I think helps, in some way. I love the idea that the Post Office gets to define its own purpose-built vehicle, and deploy it, en masse, all across the country. When else does that happen? I also love that nearly all the main competitors competing to make the Next Generation Delivery Vehicle are relatively unknown in the mainstream. I just hope something nice and weird wins. it'll really deliver the mail. Literally.